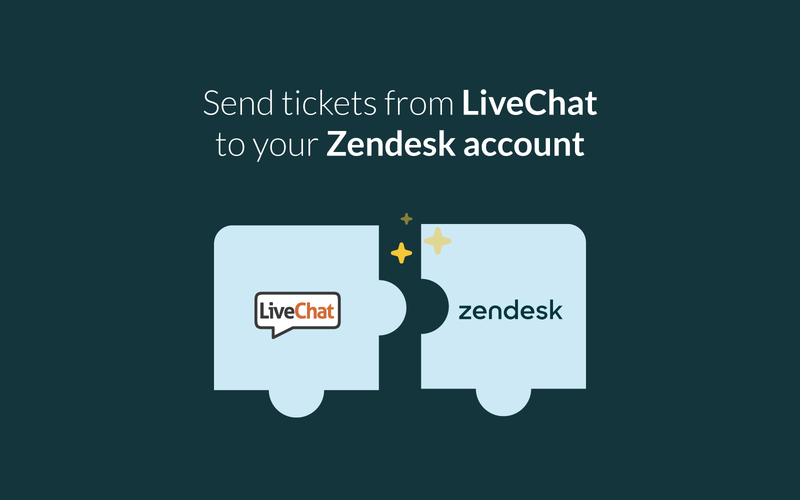 The Zendesk integration makes it easy to create tickets in Zendesk right from the LiveChat application: while chatting with website visitors and from the archived chats. What’s more, if you chat with a visitor who provides an e-mail address that has already been used to create a ticket in Zendesk, the ticket history will be automatically displayed in LiveChat. Plus, the integration allows you to forward offline messages as tickets to Zendesk. Zendesk is a customer service platform. It gathers all customer feedback from a variety of sources such as emails, chats, phone calls, tweets, and brings it all to your support team. The solution allows support agents to quickly seek the cases that need their immediate attention and deal with the customer issues right away. It also provides external information tools to help agents with their problem-solving actions. Customer feedback is not the only thing that is brought together to the same place though. Zendesk is also the collaboration platform that your coworkers from different departments can use to work collectively. It helps to generate reports and statistics to evaluate how the software affects your efficiency. Integrate LiveChat with Zendesk with our dedicated plugin – no need to dabble in any kind of advanced configuration. To ease things up even further, our step-by-step tutorial will guide yu through the entire process. We like to keep things easy for you! With our integration, you can not only save your chats as tickets but also automatically forward all offline messages straight to your Zendesk account. Use this opportunity to keep all of your communication in one place. LiveChat can automatically load the last five tickets associated with the provided address and display them below your customer’s profile. You can preview the history of your customer’s tickets from the Archives section as well. All offline messages will be automatically sent to your Zendesk. No need for any additional configuration. Using LiveChat and Zendesk makes it easy to manage all of your customer requests and follow-up activities from one place. With LiveChat comes tons of customer data — the pre-chat survey collects contact details, chat transcripts give powerful sales insights. Post-chat surveys can be used to gather feedback that will help you improve your products and services. Thanks to our LiveChat & Zendesk integration, you can easily monitor customer engagement, conduct quality control and supervise agents. Start using LiveChat with Zendesk now!